The New York Staff Band is pleased to announce the second annual NYSB Composer Contest (Christmas). Below you will find a description of the guidelines, eligibility and submission requirements for the competition. Please direct all questions to Brindley Venables at brindley.venables@use.salvationarmy.org. APPLICATION DEADLINE: All submissions must be received by 11:59 PM on April 15, 2019. ELIGIBILITY: The Contest is open to anyone, excluding current NYSB members. WINNING PRIZE: The winning piece will be published in the 85th American Band Journal (Christmas edition) and recorded for the NYSB’s Christmas CD being released in 2020. 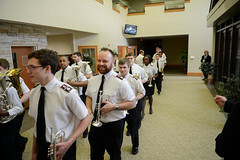 SUBMISSION REQUIREMENTS: American Band Journal Scoring (see ABJ Composer Guidelines) – score and parts (Sibelius, Finale or PDF formats only please); midi / mp3 file; and application should be submitted to http://www.nysb.org/musicministry/nysbcomposercontest/ or emailed to brindley.venables@use.salvationarmy.org by April 15, 2019. ADJUDICATION: All submissions will be adjudicated by a panel from the USA Eastern Territorial Music Department who will study each score and determine three finalists. The New York Staff Band will then perform the pieces (in rehearsal) and vote for the winner. -The piece should be written for brass band scoring (American Band Journal format – see ABJ Guidelines). -The total length of the piece should not exceed 100 measures. -The piece may not have already received a premiere or been published or recorded. In addition, the piece should not be awaiting publication with any publisher. -The piece should contain Christmas public domain songs. I. Full brass band score and set of parts (Sibelius, Finale or PDF formats only please). III. Completed application form (online at http://www.nysb.org/musicministry/nysbcomposercontest/).